From Marvel Studios, a production company who in seven years time has transformed from a middling presence to a unstoppable behemoth, comes the follow-up to their 2012 mega-hit The Avengers. In true sequel fashion, Marvel ups the ante this time with more superheroes, more action, more subplots…more of just about everything. 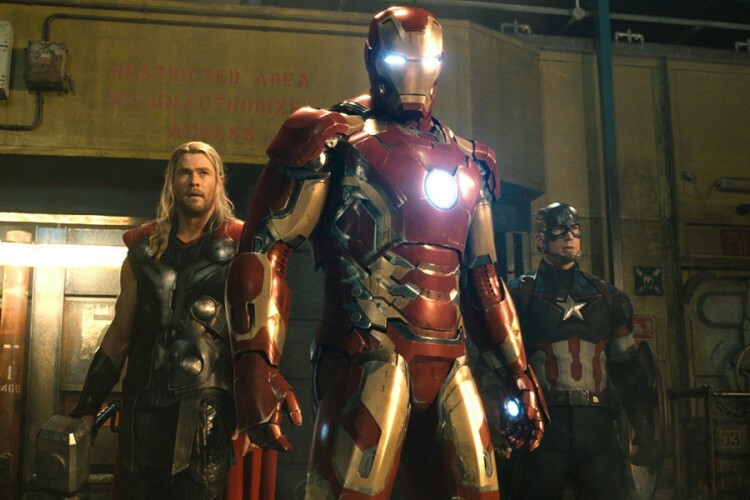 Avengers: Age of Ultron does suffer in comparison to its predecessor, mainly due to the lack of surprise factor that comes along with seeing these characters together for the first time, but it also brings enough of the original film’s frenetic energy and self-aware humor to make it worth recommending. The story hinges on Tony Stark’s (Robert Downey Jr.) discovery of a new form of artificial intelligence within one of the coveted Infinity Stones, which he secretly utilizes to advance his Ultron defense program. Because he has apparently never seen a science fiction movie, he is surprised when the newly born technology becomes sentient and threatens to eliminate the human race from the planet. The Avengers must once again overcome their personal differences to defeat Ultron’s massive robot army along with the new mutant villains Quicksilver (Aaron Taylor-Johnson) and Scarlet Witch (Elizabeth Olsen). Inevitably, this conflict leads up to a gigantic setpiece that overtakes the final 45 minutes of the movie in similar fashion to the first film but in total, the action comes across as more frenzied and sometimes confused in Age of Ultron. Both clearly make ample use of computer generated effects but something about this outing feels a bit more artificial. Still, there’s no lack of crowd pleasing fight scenes here, the most memorable including an extended showdown between a mind-altered Hulk and a heavily armored Iron Man that should prove to be immensely satisfying for comic book fans and casual fans alike. The Evil Plot is not terribly original here but as the primary villain, James Spader does bring a great deal of gleeful menace to Ultron. Most specifically, I was especially impressed with the facial detail that was implemented for his character. Hallmarks of Spader’s past performances, like the intimidating stare and even the pursing of the lips, are somehow translated on the face of this hulking automaton. While it might not make much logical sense that Ultron would have such a killer sense of humor, it does stay consistent with the witty atmosphere that director Joss Whedon has established in his Avengers universe. The humor and personality that Whedon has brought to these movies remain their most worthy attributes. We can watch cars explode and civilians scream in just about any superhero movie but the interplay between these legendary characters is bracingly unique to this series. Whether its a running joke about Captain America’s distaste for profanity or Robert Downey Jr.’s hilarious line reading during the discovery of a secret passageway, Age of Ultron has no shortage of unexpected laughs. Here’s hoping that the Russo Brothers can stay on the right track when they take over the Avengers series in 2018.